Join the experts at ThirtyFifty for a day of wine tasting to learn more about wine in a fun and informal environment. Our One Day Wine Courses are great value days out priced from £89 per person (including lunch) and are available in London, Bristol, Cardiff, Buckinghamshire and Cheshire. A full list of dates are below. The day typically starts from 10.30am until 4.00pm with a delicious 3 course food & wine matching lunch and coffee in the afternoon. With both days we kick off with an introduction on how to taste wine and we taste 16 great quality wines from around the world including whites, reds, fizz and dessert wines. We have also introduced a Saturday tasting with champagne & sparkling wine and a three course lunch, for those who love to indulge in bubbles! You'll taste 10 sparkling wines including 3 champagnes to discover the different styles and find out which is your favourite fizz! The tasting and lunch is currently only available in London. The timings are from 11am until 3pm - for more info and dates, please visit Champagne Experiences. A solid grounding on all aspects of enjoying wine and tasting wine, with 16 wines to taste and a delicious 3 course lunch. Single varietals or blended wines? Find out why winemakers blend and try it yourself to see if you can make a better wine! Sparkling wines - discover three different methods for making fizz and how this affects the style. Tips on buying, storing and serving wine. Finish the day with a delicious dessert wine. A treat for our palates and the best way to end a glorious day of wine tasting! A solid grounding in wine plus discover why you like certain wines and how wine and food work best together. Taste 16 wines and enjoy a 3 course lunch. Which styles of wine you are most likely to like, according to how sensitive your tastebuds are. What to look for in wine and how the 4 components - tannins, acidity, sugar, alcohol - are key for matching wine with food. Tips for ordering wine at restaurants and getting the most out of a sommelier or wine waiter. How to spot, and even fix, common wine faults. How different wine glass shapes change the way wine tastes and how to drink better wine without spending more. Finish the day with 2 sparkling wines to say cheers and thank you for coming to our fabulous day of wine tasting! Join us for a brilliant day out in London, choose from our One Day Wine Course, Discovery Day Course or Champagne & Sparkling Wine Course & Lunch. All include a fantastic 3 course lunch. Our One Day Wine Courses and Discovery Days are run on Saturdays and start at 10.30am and finish at 4pm. Our Champagne and Sparkling day starts at 11am and finishes at 3pm. Numbers are restricted to a maximum of 18. Follow for a full list of our different Wine Tasting Courses and Experiences in London. To book select the date you'd like to attend below to add to your basket. 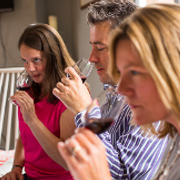 Join us for a brilliant day out in Bristol, tasting 16 wines and a fantastic 3 course lunch. All our One Day Wine Courses are run on Saturdays and typically start at 10.30am and finish at 4pm. Numbers are restricted to a maximum of 18. Join us for a brilliant day out in Cardiff, tasting 16 wines and a fantastic 3 course lunch. All our One Day Wine Courses are run on Saturdays and typically start at 10.30am and finish at 4pm. Numbers are restricted to a maximum of 18. Follow for a full list of our different Wine Tasting Courses and Experiences in Cardiff. To book select the date you'd like to attend below to add to your basket. The Missenden Abbey one day wine course combines 16 wines to taste during the day with a break for a buffet lunch and afternoon coffee. Accommodation is available on the Saturday night including dinner and bed & breakfast for an additional £60 per person. The Frodsham one day wine course combines 16 wines to taste during the day with a break for a buffet lunch and afternoon coffee. You can switch your booking onto a different date provided a minimum of 4 weeks notice is given. You can transfer your place to another person provided 24 hours notice is given. Open-dated vouchers are valid for 24 months after the date of issue.